How can I feel pride in my identity? Due to the historic social and religious taboos in Ireland, individuals who are gay may tend to experience negative self-image or criticism (even today). Because individuals who are homosexual do not feel that they fit with “expectations” and experience unequal power relations in Irish society they may self-reject and perceive themselves with low worth. The gay and lesbian community reports that low support in interpersonal (close family and friends) relationships increases these negative assumptions about the self, and high support in interpersonal relationships helps them integrate their sexuality into identity and feel recognized and validated. That said, it is very important to recognize the diversity and uniqueness of each human person. This year we’re commemorating the 25th anniversary of the decriminalisation of homosexuality in Ireland. 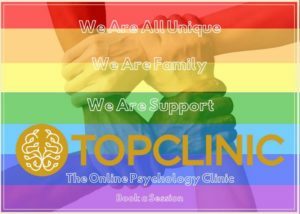 At TOP Clinic, we can help you with your own sense of self identity acceptance, expression and advocacy so you may experience increased support from close family and friends. You ma request a session using the booking form.